Bowling is a fantastic sport because the concept is so simple – all you’re really doing is throwing a ball down a lane to knock pins down, and nothing more. However, actually hitting all of the pins on every try is certainly easier said than done. In no other sport is there such a stark contrast between a simple concept and a difficult execution, but because of this, we here at Lucky66 Bowl in Albuquerque believe that joining a bowling league at our bowling alley is perfect for nearly anyone. Why? That’s what today’s blog post is about! From your ultimate stop in Albuquerque for party and event rentals at our banquet center to our exciting sand volleyball games, there is really is something for everyone at our Albuquerque bowling alley. Fun is our first priority here at Lucky66 Bowl, so come join us! Learn more about our bowling services here or explore our special events services here. Otherwise, let’s look at a few reasons why you should join a bowling league. You don’t need to be a pro to bowl like a pro. Bowling leagues are great because anyone at any skill level can join – there’s always a group that accommodates for just about any skill level or bowling experience. From a Jr. bumper bowler to a consistent 200+ game, all a bowling league truly requires from you is your weekly commitment and a willingness to have a lot of fun! If you’re showing up every week and playing a few games each time, it’s not like your bowling performance is going to get any worse. In fact, you might be surprised at some of your scores over time, even if you think you’re a gutterball-prone player. Soon, you might be disappointed in a score less than 150, or even less than 200…all the way to anything less than a perfect game! Just make sure to keep a positive attitude and have fun when your games don’t meet your expectations. Who doesn’t like making friends? From total strangers on the first week to best buds by the end of the week, a bowling league is a great social dynamic to meet people of a similar age and interest to you. You’re all bowling, after all, so you already have an interest in common. With some beer and food, you basically have a weekly party where it’s hard not to make friends. You committed to a league and probably prepaid for all of your games ahead of time, and bowling alleys like Lucky66 Bowl really appreciate that. As a token of appreciation, most bowling centers will give you considerable discounts on things like food, drinks at the bar, discounted rates for standard recreational play, and even deals at the pro shop. If you’re already playing every week as it is, then that discount at the pro shop could come in handy to get your own bowling bowl, shoes, ball bag, and so forth. Come Join A League Today At Lucky66 Bowl! 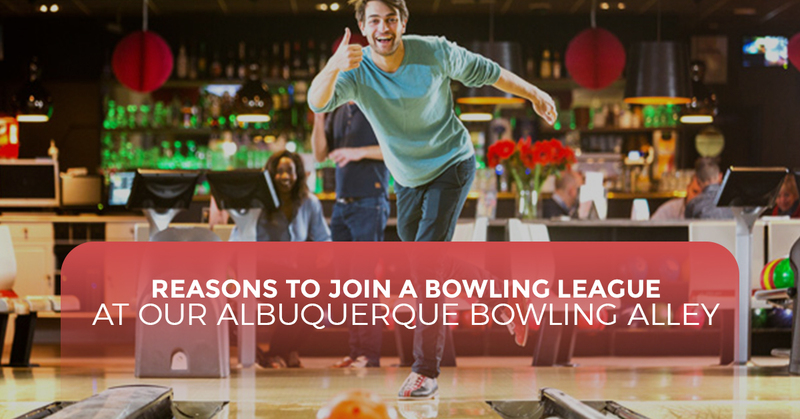 If you enjoy bowling even a little bit, then we guarantee that a bowling league at our Albuquerque bowling center will be nothing short of the highlight of your week! For the best ten pin bowling and bowling deals in the greater Albuquerque area, look no further than Lucky66 Bowl. Contact us to get started with a bowling league today!